Described as a kids musical comedy show, the Jelly Jamm stories revolve around the adventures of Goomo, Rita, Mina, Ongo and Bello who live on a mysterious planet known as Jammbo. Bandai signed up as the master toy licensee, and created a whole range of Jelly Jamm toys to fill retailer’s shelves. Undoubtedly they make some of the best action figures around, most of them based on the main characters, as well as soft toys, playsets, collectable figures and a host of other merchandise. Jammbo is a planet that features strange craters with holes in them, and is rumoured to be the place where music began in the whole universe! Even the wind, plants and animals use music as their only form of expression. Designed for kids aged between 4 and 7 years old, Jelly Jamm toys will be joined by video games, DVDs, books and whole series of music tracks from the series. Spanish based Vodka Capital is the show’s producers which is shown by Turner Enterprises across TV channels in Europe. Similar in its theme to CBeebies ZingZillas show, Jelly Jamm has music at its heart. 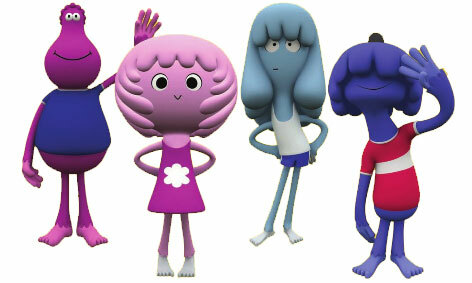 Each of the five Jelly Jamm characters has their own colour as well as their own individual musical sound and personality. Rita is rumoured to be incredibly curious whilst Goomo is completely the opposite and very shy. Leader of the group of friends is Bello who needs to look after the absent minded Ongo. Mina is stubborn yet sensible and is a stabilising influence with the team. Kids will just love it when they all pull together and create their distinctive Jelly Sound. Toy manufacturers have had a lot of fun creating and incredible selection of Jelly Jamm toys.